100 Mile Time Trial: Doing Things I Thought I Couldn’t #2 – Ride. Write. Repeat. A one hundred mile time trial has always sounded a bit like torture to me. Mental torture, with a side order of back pain and complementary saddle sores. Yet today I finally finished by first century time trial. Up until 2014, I always had the excuse that I’d never actually ridden 100 miles, but a couple of Majorca trips later and I’m well past that justification. A century ride with the benefit of drafting and coffee stops, however, is something very different to a century ride on your own with an occasional road side bottle swap and the hum of your aero helmet for company, so I still wasn’t planning on attempting the 100 this year. Then when I discovered my boredom busting plans to play the triathlon game this year were going to be punctuated with misery inducing running injuries, I decided to kill the 10-and-25-mile-time-trial boredom with new challenges – namely, assorted open water swims and my biggest nemesis – the 100 mile time trial. THAT. Exactly that, is what I’m after. I’m never going to be ‘the fastest’, so I’m really more interested in exploring what I CAN do at the moment. 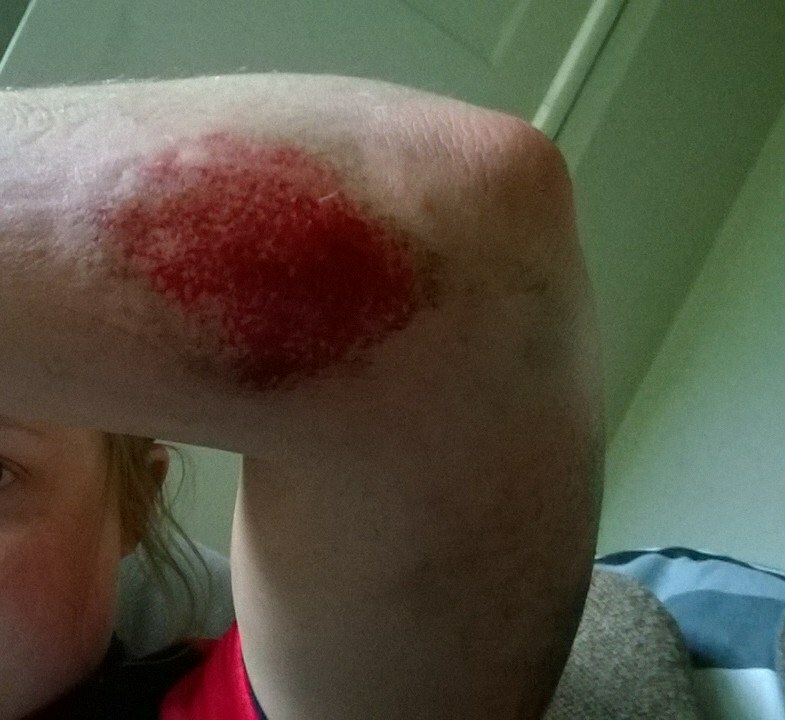 A crash before 50 mile time trial number 2 of the season meant I didn’t have as much racing under my belt as I wanted, and the last few weekends have been mainly about trying to get 70-80 miles in, so at least I’d have the endurance there and a little bit of confidence. I went to bed the night before the event very much with the mentality of: “This is going to be really tough, and I may not finish it – if that happens, that’s fine. Worst case scenario is not finishing, and I reckon that’s ok.” After spending the last couple of years obsessing over cutting off seconds on 25 mile courses, it’s kind of liberating to ride an event with a looming question mark over your ability to finish. The forecast had been looking pretty grim all week, and when my alarm brought me into the world at 4am this morning, stubborn rain clouds still appeared from 9am onwards, 2.5 hours after my start time. Regardless, I ate a large bowl of porridge (it’s not often I struggle to eat breakfast), loaded the car and set off- having enjoyed about 6 hours of broken sleep. My bike had seen a little alteration, with a slightly raised front end. 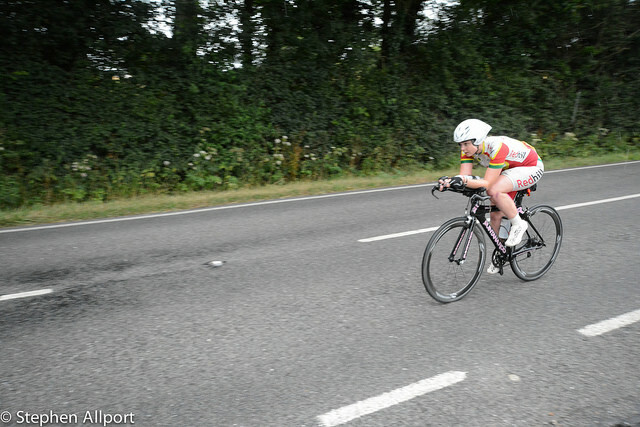 Less, aero, I know – but with fear of DNF at front of mind, less pressure on my back seemed a good idea. My other worry was my lack of support. I arrived at the HQ with a bag of bottles, hoping someone might be able to pass them to me. I’ve been a bottle-handler at a 100 before, for my other half – and ended up catering for 3 people in the end through similar circumstances befalling them, so I was fairly confident – and with good reason. I spotted a nice looking man supporting his wife, from Charlotteville – and he accepted my bottles and was happy to help out. The G100/61 course isn’t a traditional dual carriageway affair – it accumulates about 2,989 ft of climbing (according to Strava). Admittedly, not a lot for 100 miles – but quite a bit for a time trial. Since I tend to ride a 25 with my heart rate in the 185-190 range, and a 50 in the 180-185 range, I’d imagined I’d be riding at around 175-180. However, from the off I was hovering closer to 165bpm. Somehow, that felt about ‘right’ for 100 miles. Of course, I’d never done this before, so I wasn’t sure – but it seemed correct. I was worried when 21 and 22 passed me in the first 15 miles, but I noticed I was also getting closer to the next lady, who had started six minutes before, so decided to stick with it. The first 20 miles were fairly up and down, and windey – I was averaging 21mph, somehow I felt a ceiling on going any faster, even for this short period – odd since I’d be at about 25mph for a 25 mile TT – but being conservative seemed like far from the worst thing I could do so I decided to just accept it. Around 20 miles in I finally caught the woman I’d been chasing – it seems she stayed a fairly close distance behind me for the rest of the event. I stopped briefly to spin my rear wheel, since my bike was making an irritating creaking noise. It wasn’t the wheel, which was good – as no one wants to ride 100 miles with a rubbing brake. Still TBC what it was – bottom bracket or pedal bearing, I assume. After a 20 mile detour through some villages, riders of the G100/61 reach ‘the course proper’ – a triangle shaped lap which they’ll repeat 4.5 times. There’s a long drag over the A24, a left turn, a short undulating section, another left, and a longer undulating section which riders will eventually start to memorize via landmarks such as ‘The Bit With the Cherries for Sale Sign’, ‘The Bit With the Craters’, ‘The Evil Ramp’ and ‘The Descent That Feels Hairy’. Usually, I ride time trials humming familiar lines from Slipknot’s Duality, and the like. It usually does the trick, but it wasn’t going to cut it for 100 miles. Since Maurice had told me: “Think of it like a little bike adventure – you’ll be riding long, snacks and drinks with you…” I ended up singing the Chilli Peppers Road Trippin, particularly. Yes – I swapped “I push my fingers into my eyyess, it’s the only thing, that slowly stops the accheeee” for “road trippin’ with, my two favourite allies, fully loaded, we got snacks and supplies”. I think I also resorted to a few Radio1 style chart hitters at some point, too. My one pace 100 mile train continued fairly comfortably, if a little too comfortable – for some time. Bottle passes were a case of ‘come to a stand still’, even knocking on the car window at one point. However, I knew full well it beat leaving my bottles in a layby, so I was very grateful for any help at all. Then, the rain started. I’d read ‘rain’ and imagined ‘spitting’. 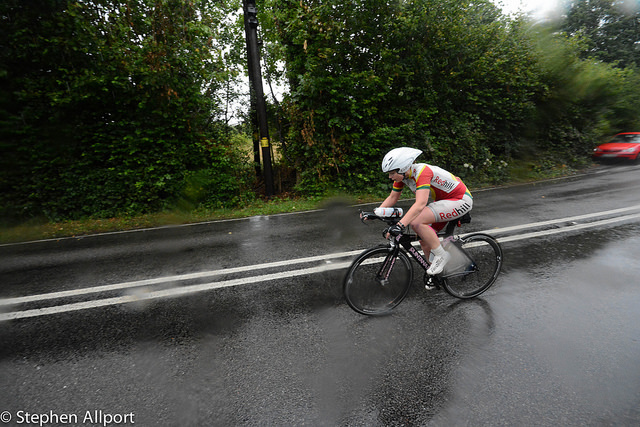 By the time I hit 50 miles, it wasn’t ‘spitting’ – it was downpour. It got really bad on my 4th trip down the A24 – the spray was hideous, cars were feeling increasingly threatening and close, and the wind on exposed sections was proving difficult. I distinctly remember shouting some expletives to the invisible crossfire at some point. Turning off the A24 wasn’t much better – the road felt slippery, as did my aero bars, and sitting with my hands on the base bar wasn’t much better. A white van overtook me near a verge and I remember imagining the organisers finding me in a ditch somewhere a week later, kid you not – but I do have an overactive imagination like that, and it kept me occupied for a while. The photographer was at the bottom of a hill, I don’t hug the white line all the time! 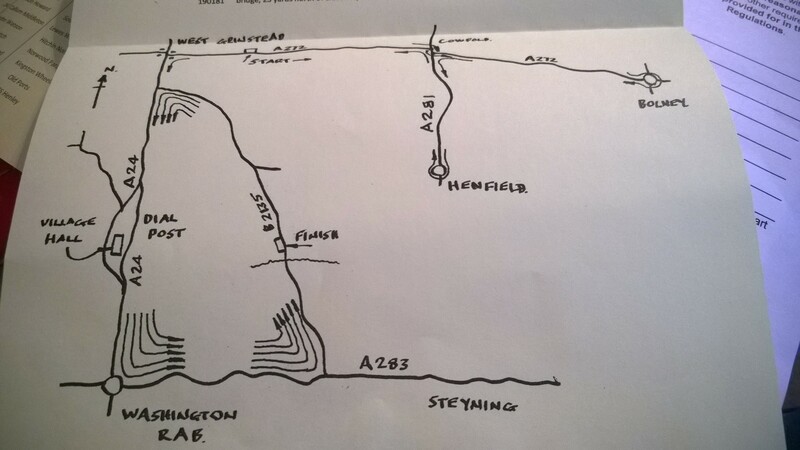 I spent the non-dual carriage way section dreading my return to the A24, and the A24 section pondering on the best way to descend later. I applauded myself when, for the first time in 4 attempts, I managed to get around the pot hole I kept forgetting was there. It was just after or just before the dead hedgehog starfishing the road. By the time I was feeling genuinely scared of the slipping and the windy and the overtaking, however, I was a good 75 miles in, and I wasn’t turning back. Though I did sort of hope to reach a chequered sign with ‘SCCU 100’ crossed out, and ‘SCCU 90’ in its place. From 75 miles, I had just one 25 left, 5 miles until only 20 to go, which was 2 x 10… It was just a case of watching the numbers tick over. I figured with all my stopping for bottles and the slow conditions, I might as well let myself stop and dip behind a bush for a wee, since it would be just one of several standstills. Putting my sopping skinsuit back on, I’ll admit, wasn’t nice. At 92 miles, I turned off the dual carriageway for the last time and had an internal celebration. This was dampened slightly when I saw a rider beside the road with a puncture – he turned out the be one of five, and I caught his eye as he solemnly walked his bike to the marshals just 250 metres away. I nodded to show I felt for him, he seemed to appreciate it – that must have hurt. At this point, the only thing that could prevent me finishing was a mechanical or a crash. Having spent weeks wondering if I was even capable of this solo 100, I was suffering in the conditions but dancing in my head. When I hit 100 miles and the sign still wasn’t in view, I began to despair – but my little groan was answered at the next turn where the snuggly looking timer keepers car came into view. I didn’t bother speeding up, in fact I think I slowed down. My heart rate had been low throughout, it hadn’t really hurt like a 50 – but I was fatigued in some other, different way. The cold started to set in once I stopped. My hands were completely white and weren’t actually working very well – the pedal back the the HQ was not a joyous experience. Especially as most of the riders who had support were getting into warm cars and having towels placed over their shaking bodies. Alas, back via the A24, I went. However, I had in my head a joy. Like the open water swim of May – I’d chosen a challenge I didn’t think I could achieve, and done it. It hadn’t been that fast, but I’d finished. Which leaves me with a new question – what else is possible? What else do I think I can’t do, that perhaps I can? A cracking effort. 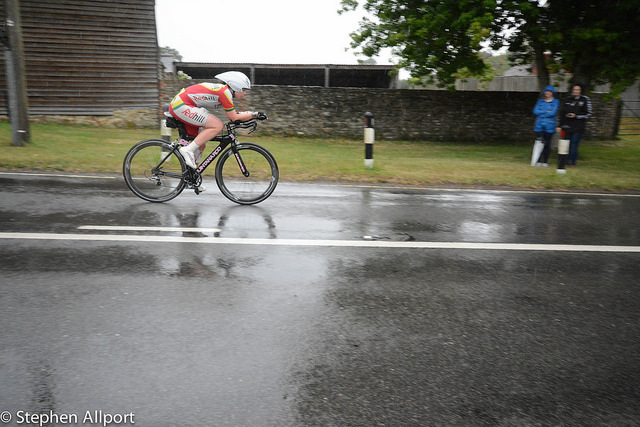 Not only riding 100 miles but riding 100 miles in that beautiful English summer weather. Good to hear somebody else sings away the pain too! Congratulations – that’s incredibly impressive! I’m in awe – as the above commenter says – doing it in the English weather adds an extra layer to what would already be a very hard task!